Translated into English with many phrases such as Five-tier-tomb, Five-element-stele (pagoda, stupa), Five-wheel-pagoda, Five-ring-tower or Gravemarkers with five-tiers. Whatever you may call them, they are made of five pieces of stones as grave markers or cenotaphs erected for the repose of the departed. Usually made of five tiers of curved stone, each expressing one of the basic elements of the universe: The earth, water, fire, wind and the sky, which Buddhists believe create everything of the universe. The bottom stone is a cube and called the Earth ring expressing the earth. From the second, a sphere (Water ring), triangular shape like pyramid (Fire ring), semi-sphere (Wind ring) and placed on top is peach-shaped hoju (mani in Sanskrit) and is called Sky ring. The concept is similar to that of Greek philosopher Aristotle (384-322 BC), who said the material universe consists of four elements; fire, air, earth and water. On each stone, there usually appears a Sanskrit symbol. Gorinto first appeared sometime in the middle of the Heian Period (794-1185) and many of them can be seen in Kyoto as well, but the ones made during the Kamakura Period are most beautiful, say experts on Gorinto. Its height ranges from one to four meters. Characteristic is that it is indigenous to Japan and can be seen in no other countries, not in China either. Most of the existing Gorinto in Kamakura were made in the late Kamakura Period. 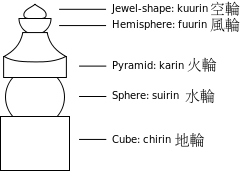 The gorinto is a distinctively Japanese style of stupa comprising five geometric forms. E. Dale Saunders, in his 1959 classic, Mudra, notes that the Japanese Shingon sect of esoteric Buddhism views the gorinto as a symbol of Dai-Nichi Buddha, who, underlying all things, manifests himself in the five elements making up the physical world. “The Buddha said: A lay-follower (upasaka) with five qualities is a jewel of a lay-follower, is a lily, is a lotus. Read more about the symbolism of the wish-fulling jewel. when did they first appear in Japan? are they are Japanese construct? I am still trying to confirm this. While the godai ideology is probably much older, I have seen a photo of small gorinto inside a Kofun tomb from an archaeological journal. If I can locate the kofun once again, this would be evidence of a gorinto earlier than the Heian Period. The location of the tomb and the likely identity of the occupant could then give us a clue as to the origin of the gorinto tradition.